Minister of State for Finance Jayant Sinha assured that the government is on track to push reforms. Minister of State for Finance Jayant Sinha at addressing the MindRush 2015 conclave at Taj Palace, New Delhi. 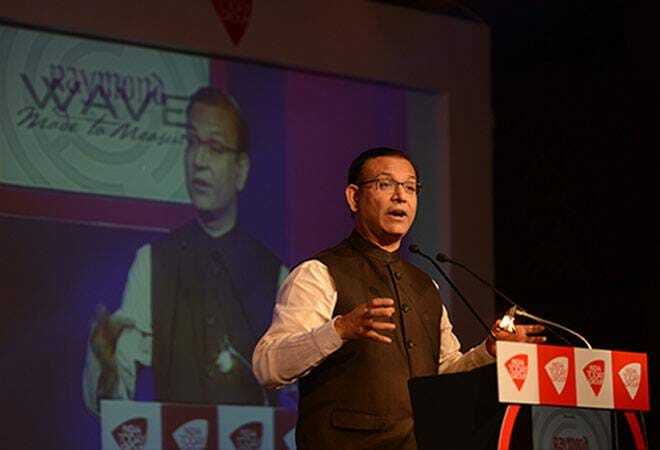 At a time when the winter session is on the verge of being wiped out because of the opposition's uproar, the Minister of State for Finance, Jayant Sinha, emphasised that the . The minister, in his speech to the India Inc., assured that the government is committed to facilitate ease of doing business, rationalise tax and ensure that competitiveness in businesses can be encouraged. The minister said the government is working on three key principles: it is pro-poor, pro-market-competitiveness and co-operative federalism. He said that the government has worked out a social security safety net for the poor. The NDA government, through various schemes, managed to open bank accounts for most of the countrymen in the lower strata. The social sector schemes are disbursing payments and subsidies directly into their bank accounts. "All these are historic steps that the NDA has taken and would transform the way the poor are treated. There will be no middle-man, the poor will get their money directly in their accounts," Sinha said. We are increasing the reach of banks, and licences for payment banks, commercial banks and deposit banks have been issued. This will not only increase the reach, but will also transform the way banking is done today. We are reducing corporate tax from 30 per cent to 25 per cent, as well as removing all the exemptions. "Most will agree that there is a series of litigation at various levels only because of exemptions. We are doing away with this," he announced. Sinha further added that the government is bullish on investments in the infrastructure sector; this includes power, roads and railways, among other verticals. "Railway Minister Suresh Prabhu has prepared the blueprint for an investment of Rs 8.56 lakh crore by 2019. Some quarters are criticising the country's plan to invest in bullet trains; I am sure they haven't gone through the numbers. JICA is providing loans at 0.1 per cent, and the payouts will start after 15 years. This is a good deal," he added. Similarly, he said, Road Minister Nitin Gadkari is able to accelerate road construction from 3 kms per day to 18 kms per day. "Critics may say that there are no big bang reforms. But, I believe that 'big bang', like beauty, lies in the eyes of the beholder," he remarked. He said that they are working with the state governments to improve the ease of doing business. The Indian establishment believes that India may become one of the top 100 countries with respect to the 'ease of doing business' parameter in World Bank's annual report. "The target is to get in to the top 50 in the corresponding year," he confidently said. "Achche din aa rahe hai (good days are approaching)," the minister reinstated. This was one of the poll planks of Prime Minister Narendra Modi promising large-scale reforms. In the last 18 months, however, the opposition has taken a dig at Modi's plank in various assembly elections. He added that the government is committed to get the goods and services tax (GST) cleared by Parliament. "Through masterful efforts and deft handling of negotiations with most of the states, we were able to build consensus on the GST issue," he said, adding that it was imperative that the principal opposition came on board too. Earlier in the day, the Chairman of the Rajya Sabha - upper house of the Parliament, called an all-party meeting and it is expected that the House may clear various other bills, including amendments in labour laws and Electricity Act; but there is no assurance on GST. "The time has come to pass GST. I implore my colleagues in the opposition to comply," Sinha urged.